EghtesadOnline: President Hassan Rouhani inaugurated three major petrochemical ventures in the southern city of Asalouyeh in Bushehr Province on Tuesday, in a ceremony attended by Oil Minister Bijan Namdar Zanganeh and other officials. According to NIPNA, the National Petrochemical Company’s official news agency, the projects, namely Marjan Petrochemical Company—aka 7th Methanol Project—in Phase 2 of South Pars in Asalouyeh, Phase 3 of Pardis Petrochemical Company and a power plant in Damavand Petrochemical Complex officially became operational. The projects have been implemented with a total investment of $1.85 billion. An important petrochemical project, 7th Methanol Project was developed in Pars Special Economic Energy Zone near Asaluyeh, a county alongside the Persian Gulf, 280 km southeast of Bushehr, according to Financil Tribune. The project, started in 2011, has been completed at a total cost of $914 million. It will produce 1.65 million tons of methanol per year. The annual feedstock of the project is about 5.1 million cubic meters of natural gas, which will be supplied by Damavand Petrochemical Company, in addition to electricity and oxygen. The new venture has created 250 jobs. Iran annually produces 5 million tons of methanol, of which 400,000 tons are exported. NPC has geared up to double the amount before 2020 by implementing ventures such as Kaveh Methanol Company in Bushehr Province with a capacity of 2.3 million tons per year and two methanol units in Bushehr Petrochemical Company by the yearend. According to Pardis Petrochemical Company's Managing Director Hossein Shahriari, Phase 3 has been set up over seven years with an annual production capacity of 1.7 million tons of urea and ammonium at an estimated cost of $570 million. "Of the new capacity, 150,000 tons will be exported, generating $257 million in revenues," he added. After it became fully operational, the company's nominal production capacity increased to 5.26 million tons, including 2.04 million tons of ammonia and 3.22 million tons of urea annually. According to Shahriari, domestic agricultural consumption of urea amounts to 700,000 tons, while 2.5 million tons are exported to customers in Europe and Latin American countries, including Argentina and Brazil. He added that the venture has created 646 direct and 1,200 indirect jobs in the region. PPC describes itself as the operator of the Middle East's largest ammonia and urea complex and one of the world's top producers of the two compounds that form the building block of many products, including plastics, textiles, pesticides, fertilizers and resin products. Based in Houston, Texas, KBR, an American technology and services provider, had previously licensed process technology of PPC’s ammonia unit, NIPNA said. Pardis is part of a cluster of petrochemical plants in Asalouyeh, home to Iran's largest gas production and refining facilities. 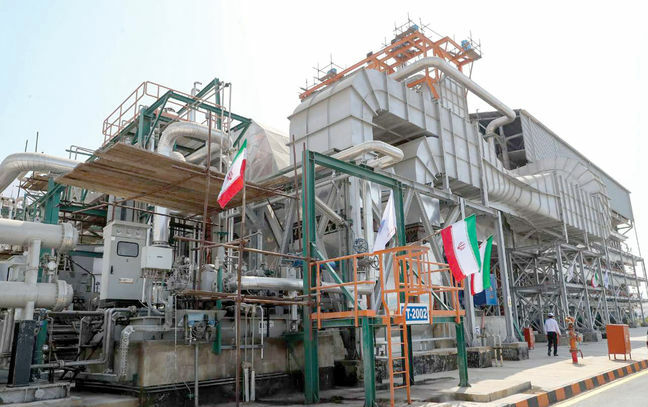 The president officially launched the first phase of the power plant in Damavand Petrochemical Complex, which is aimed at adding 648 megawatts of electricity to 12 petrochemical units in its Phase 2. The scheme, worth €305 million, also produces 780 tons of steam per year. The plant, designed in three phases, will produce 2,000 MW of electricity upon completion to feed the region's petrochemical companies. It will also provide petrochemical companies with 400,000 cubic meters of industrial water, 1,890 tons of steam and wastewater treatment facilities. It will also produce 650,000 cubic meters of oxygen for methanol units. Damavand Petrochemical Complex provides utilities and offsite services required for petrochemical projects in Phase II of 7th Methanol Project. The country's petrochem output currently stands at 62.15 million tons per year, which will exceed 65.55 million tons with a total revenue of $14 billion when the new ventures go on stream. Other ventures, namely Kavian, Nouri and Jam petrochemical companies, as well as Morvarid and Mobin petrochemical complexes in the southern port city of Asalouyeh, are underway. Plans have been devised to raise output in Bandar Imam Petrochemical Complex and Shahid Tondgouyan Petrochemical Complex in Bandar Mahshahr, Takht-e-Jamshid Petrochemical Plant in Mahshahr Special Petrochemical Economic Zone in Khuzestan Province and Urmia Petrochemical Plant in West Azarbaijan Province by 150,000 tons, 26,000 tons, 50,000 tons and 40,000 tons per annum respectively.